Biographies focusing individually on Albert Einstein, Thomas Edison, Isaac Newton, Alexander Graham Bell, and Henry Ford abound. Someone, somewhere, is right now researching and writing yet another dissertation on each of them and other well-known historical figures of science and engineering. Guys like Michael Faraday rarely have books dedicated solely to their lives and accomplishments, even though it is not unreasonable to expect that they would. Faraday, Alessandro Volta, Georg Ohm, André-Marie Ampère, Anders Celsius, Max Planck, et al, are usually included in books featuring a collection of people who have achieved notoriety in similar fields. Accordingly, most of us know little, if anything, about their upbringings or what led to their claims to fame. Here is a brief insight into just those aspects of the man whose namesake is the root of units of capacitance and identifies a common type of shield (aka "cage") used to isolate devices from external electromagnetic fields. In case you are interested: "Michael Faraday: Father of Electronics," "Volta: Science and Culture in the Age of Enlightenment," "Georg Simon Ohm," " Mémoires sur l'Électromagnétisme et l'Électrodynamique" "Anders Celsius (Scientists at Work)," "Planck: Driven by Vision, Broken by War"
As a boy in the early 1800's, Michael Faraday hardly looked the part of someone destined to grow up to become one of the world's most productive scientific geniuses. The son of a poor London blacksmith, Faraday spent much of his boyhood standing in welfare lines waiting for food. Out of sheer desperation, his family permitted him to drop out of school at age 13 to earn his own way as an errand boy in a bookstore. For young Michael, leaving school was no great loss since he had no fondness for school. Faraday soon found that he had a liking for books, especially the ones about popularized science. Fortunately, his employer was an understanding man who allowed the boy to read between errands and janitorial duties. One day a customer gave Faraday a ticket to a lecture that was to be given by the eminent British scientist, Sir Humphry Davy. Owing to his reading, Faraday understood most of what Davy said at the lecture. He also managed to take down an incredibly complete and accurate set of lecture notes. A few days later, he copied the notes into a booklet and mailed them to Davy, along with a request for any kind of a job in the scientist's laboratory. Davy was impressed and flattered and offered Faraday a job as bottle washer in his chemistry lab. The Scientist Emerges. Faraday's abilities and enthusiasm soon prompted Davy to promote him to research assistant. After that, Faraday's list of accomplishments makes most success stories seem uneventful. By the time he was 30, he had worked his way up to being one of Europe's most popular experimenters and lecturers. Almost entirely self-taught, Faraday conducted his own experiments in chemistry and electricity with a genius and precision that surpassed that of most scientists of his time. He had no liking for mathematics, but he made up for the deficiency by drawing elaborate analogies between everyday situations and his abstract theories. The Coulomb Torsion Balance. The instrument is initially calibrated by turning the torsion micrometer so that it reads zero when the two pith balls just touch. 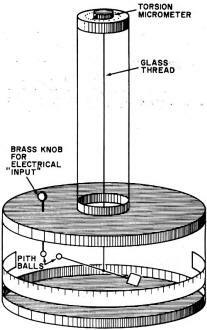 Placing an electrical charge onto the pith balls makes the suspended ball rotate away from the fixed one. Faraday rotated the torsion micrometer until the charged pith balls were exactly 20° apart, then he recorded the number of degrees and minutes he turned the micrometer knob. By knowing the torsion constant of the glass thread, it was possible to calculate the amount of force and, hence, the amount of the electrical charge that was on the balls. In 1831, Faraday began his famous series of experiments that eventually led to his discovery of electromagnetic induction and the invention of the first electric motors and generators. It was only his lack of mathematical sophistication that prevented Faraday from becoming the discoverer of radio. Clerk Maxwell, a more mathematically minded investigator, later used Faraday's principles to formulate the basic equations for electromagnetic waves. 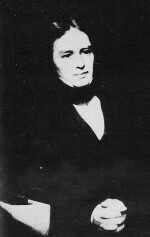 Ever in search of new knowledge, Faraday by 1836 returned to the electrolysis experiments he had once shared with Davy. By placing sheets of metallic foil on opposite faces of a block of ice, he demonstrating that no current could flow through the ice until it melted. To the contrary; the ice seemed to gather and store an electrical charge. But once the ice melted, current began to flow and decompose the water into its fundamental elements of oxygen and hydrogen. 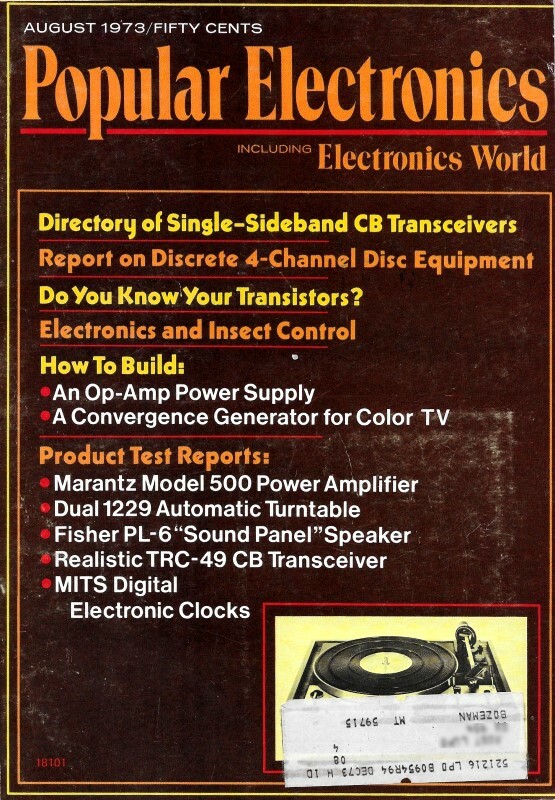 While this experiment was popular among professional and amateur experimenters of the time, Faraday saw some important features in it that others had overlooked. The idea that current-carrying conductors produce a magnetic field had served him quite well in his work with induction; so, he proposed the existence of another kind of field - an electric field - to explain the storage quality of ice and all other kinds of nonconductors. In his laboratory notes dated December 23, 1836, Faraday describes a new kind of apparatus for studying the relationships between different types of insulating materials and their "inductive capacity." 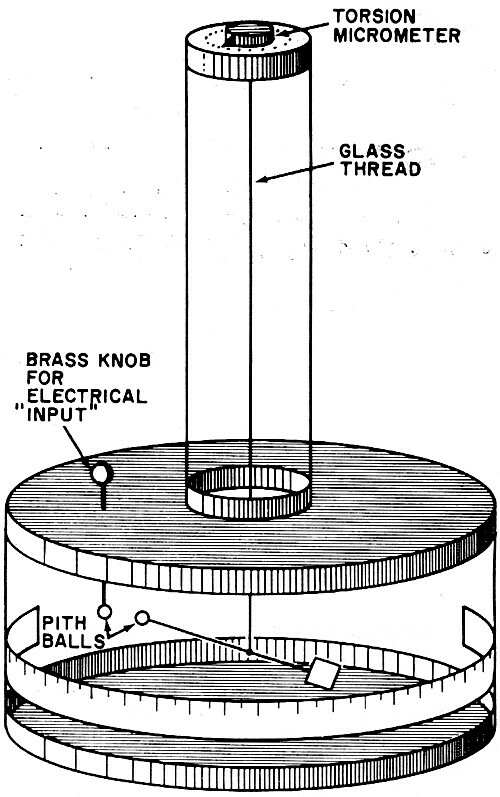 Faraday built devices made of two hollow airtight brass spheres. One of the spheres was small enough to fit inside the other, leaving 1/2 inch of space all around for inserting different types of insulating gases or solids. He suspended the smaller sphere inside the larger by means of a glass tube. A wire running through the glass tube provided electrical connection to the inner sphere. The outer sphere was mounted on a stand equipped with a valve that let him evacuate the space between the spheres or fill the space with different kinds of gases. He also fashioned a mold for forming solid materials that would perfectly fit into the space. With this apparatus, Faraday was able to construct a "spherical" capacitor whose plates he could separate with any type of dielectric material of his choosing. His main idea was to compare the "inductive capacities" (a term now known as "dielectric constant") of different insulating materials by charging the spheres with a static potential and measuring the amount of charge they acquired. To measure the stored charges, Faraday used a sensitive torsion balance invented by Coulomb. This apparatus consisted of a thin lacquered straw about the size of a toothpick suspended at right angles from a length of fine glass thread. Minute forces applied in the proper direction to one end of the straw made the straw twist about the thread. By measuring the angle of the twist, an experimenter could calculate the actual amount of applied force. To make the torsion balance sensitive to electrostatic charges, Faraday attached a small pith ball to one end of the straw. He attached a piece of paper to the opposite end to serve as a damper for the mechanical oscillations and act as a counterweight. Another pith ball, fixed to the frame of the balance, carried test charges to the space around the ball on the straw. Charging the fixed pith ball made the movable one rotate through an arc Faraday measured by means of a piece of paper scribed with units of arc in degrees and minutes. A Faraday Sphere. Faraday used this piece of equipment to determine the "specific inductive capacity" (which we now call the dielectric constant) of different types of insulating materials. In his experiments, Faraday would place a dielectric material between the spheres, charge them with a static voltage, and measure the amount of charge with the torsion balance. He also kept track of how fast the charges leaked off the spheres, discovering that different materials took on different amounts of charge. Spheres separated by glass, for example, took on larger charges and held them longer than did spheres separated by air or hydrogen. This confirmed his suspicion that different insulating materials have different "specific inductive capacities." What is more important, these experiments backed up his theory of electrostatic lines of force and cleared up a longstanding problem concerning charged insulators. Other researchers believed that the metallic plates and not the dielectric between them held the stored charges. By demonstrating that electrostatic lines of force within the dielectric - not the plates - held the stored charge, Faraday cleared up a prevalent misconception. The Perfectionist. Since Faraday did not like to bother with mathematics, he was content to explain his findings in terms of pictures which showed lines of force more concentrated in some materials than in others. His data was so accurate and complete that other scientists incorporated his notion of "specific inductive capacity" into formal equations that stand to this day. Faraday's notes indicate that he often mistrusted the readings he obtained from the torsion balance. To convince himself, and many critics as well, that the amount of charge stored within different types of materials was really different, he frequently used two identical sets of hollow spheres. He would charge one set, measure the charge with the torsion balance, and then touch the charged set of spheres to an uncharged set. Whenever the two sets contained the same type of dielectric, they divided the original charge equally. But when one set of spheres contained a better dielectric than the other, the set with the better dielectric took on a large percentage of the original charge. The scientific community accepted Faraday's theories and experimental results with enthusiasm. As a result of his work with dielectric lines of force and dielectric materials, the 1891 International Electrical Congress voted to name the electrical unit of capacitance, the "Farad," in honor of Michael Faraday.